Ehhhh maybe some but not all. I started playing last month and in probably 20 or so bases I had exactly 1 dupe die of slime lung one time, with zero instances of food poisoning. I figured out how to prevent slimelung very quickly. The only reason I built med bays was because I kept sending my scientist to research geysers with no exosuit and they would get injured. I felt (and kind of still feel) that the germ system is way too easy. While I do agree it's currently too easy to get sick, I still don't do much to prevent it. Even if the whole base gets infected with slimelung, it's more of an annoyance than anything else since they don't die from anything. I do agree to that. In the old system, I could mine out (carefully, of course) entire slime biomes without suits and nobody got sick. But the new system is just far to opaque. I have no idea how it works. Example: My "germ resistant" dupe was the first one to get sick 4 times before anybody else got anything and that was with all doing the same jobs. Pumping all contamined gasses passing through a chlorine room is the only thing I had in my mind but couldn't test yet. Try using a setup similar to the water decontamination system. Store infected gasses in a reservoir with chlorine around. It should kill off the germs. Abe just get sick in the same circumstances. Must have been that morb. 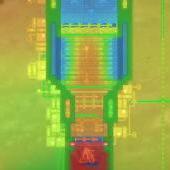 This morb appeared here few cycles before. It complitelly surrounded by deodorizers. And there is neither PO2 nor slimilung in the air. Also, the trouble began far earlier the first morb appeared inside the base. Naaa, not that bad. Just needs some balancing and some explanation. Also, this is early access, it is quite fine for the devs to experiment. I tested qol3 for a few hours playing 3 early games. I really don't understand how my dupes get deseases. I tested slimelung very carefully and it seems my dups get sicks when waking up after night while they worked all day in slime without getting sick. Do dups get sick from breathing or do they get sick from having slimelung on them, or both? Does someone understand how it works? I started a new colony on the QoL 3 test branch, and almost 1000 cycles in I still don't understand completely how it works. In that time, I've only had 3 dupes catch it. 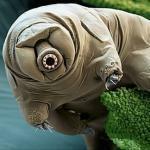 From what I understand, they have a chance to contract slimelung from breathing in even 1 germ. I'm assuming more germs/exposure means a higher likelihood of catching it. It also seems like there is an "incubation" period before the dupes actually show signs/symptoms, and could still fight it off. Also, sick dupes will sneeze polluted 02 and slimelung germs INSIDE your base, so quarantining is important. It is treated at the new doctor's station/sick bay building with advanced cure pills crafted from the apothecary, so make sure you have both AND a doctor before venturing too far into slime biomes. Honestly, I prefer this, as before I could just spam deodorizers, chomp boosters, and restrict access to dupes who had accumulated too many germs (I didn't start worrying until they had about 100,000 slimelung germs in them). Slimelung had become trivial and vestigial. The most frustrating part about the new change is I can not properly "quarantine" them in my medbay, because having slimelung still makes them "ineligible" to be assigned to a med-bed/triage cot. I suppose I could expand my med-bay with a spare proper bed or two to assign to slimelung dupes, and restrict their access, but honestly it happens so rarely and is treated quickly at the sick bay building, so it's moot to me. worst part is their infection does not matter if exposed to 1 or 1 million germs so you in fact ignore the infection mechanic completely. Seems stupid. I don't believe it's possible to treat a dupe who is "exposed" you can only treat them after they get sick, can anyone confirm this? Well in theory we should be able to use the med bay to quarantine sick dupes so they don`t spread slimelung around the base. I`m not sure how well you can quarantine them in QoL3 though. I'm finding a lot of trouble with slimelung. Even a tiny puff of polluted oxygen here and there around the base appears to be enough to cause an infection. Currently 3 of my 6 dupes have it. This is a far cry from QoLII where with careful management I could prevent an infection from ever occurring. I can't say I'm particularly happy about the change tbh, it just feels like a random and unavoidable debuff. You get it from infected polluted oxygen. You do not get it from polluted oxygen that is not infected. You do not get it from other gases (notably oxygen) that are infected. I have seen a whole lot of evidence for the first point and a general lack of evidence that the other two points are wrong. If you have an infected polluted oxygen bubble on your map, approach with extreme caution. If you can place a deodorizer, break into the area, and run, you should be okay if the infected polluted oxygen is transformed into infected oxygen by the deodorizer, and then gets into your base. Growing mushrooms in your base is now a dangerous thing because slime accidents will cause slimelung. Trying to mine slime in your base is similarly dangerous. Eventually you will drop slime on the floor, it will off-gas infected polluted oxygen, and your dupes will get slimelung. The old food poisoning prevention mechanics work. I have never gotten it in QOL3, but I don't cook with water, and I have wash basins. Slime lung has been made difficult to avoid, and if you don't want to get it, use exosuits, avoid slime, and/or avoid swamp biomes. Anyone know how to exterminate sporechid germs? I accidentally left an open small hole from oil biome and germs took over the entire map. Any other way to get rid of that besides venting all the contamined gasses to space? I don't know anything about sporechid germs, so I can't give any definitive advice. However, I did accidentally contaminate a fresh water supply with quite a bit of food poisoning. I simply cut off the supply of germs and waited about 15 cycles and eventually the germs died off on their own. Any chance that might work for your situation? if boosters (from apothecary) are available. If the dupe comes into brief contact with, say, sporelung (one breath) and then returns to the base and doesn't get exposed again, odds are your dupe will not get sick if they're a normal dupe in normal play. If your dupe spends half the day digging slime, then comes into the base and goes to bed, they might get sick sometime during the night. If your dupe spends several days mining slime, odds are high that your dupe will get sick. Once your dupe is sick with slimelung, it can be a spiraling funnel of despair. If you have the apothecary, then dupes who aren't sick will start popping boosters and dupes who ARE sick will start popping cures (provided you have them in stock). 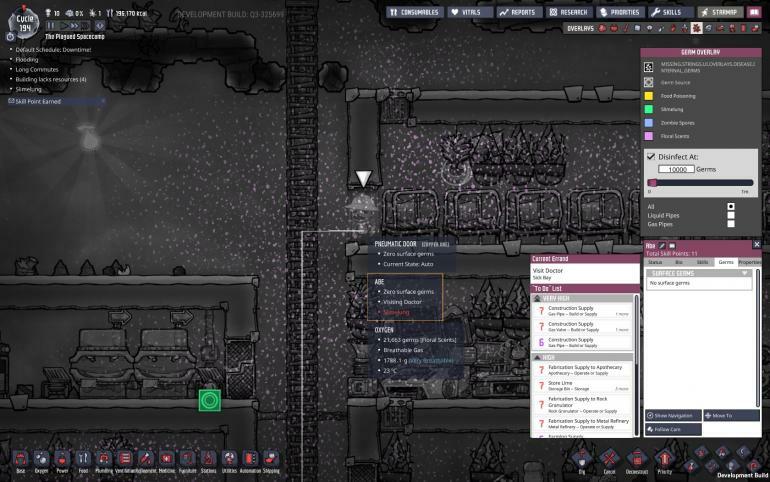 If you have the disease clinic, you can quarantine the sick dupe (the triage cot mostly helps if your dupe took damage from attacking hatches or getting too close to lava). If you don't have the apothecary or the disease clinic... well, your dupes are going to be pretty miserable pretty quickly. When a dupe breathes in slimelung (or eats food poisoning), it doesn't matter how much it is, they'll get "exposed to" the germs. This I've observed, this I'm sure of. This includes if a dupe that is already sick with slimelung sneezes with another dupe beside them - the one beside them becomes "exposed to" slimelung. Now, being exposed to a disease doesn't do anything to the dupe. They have a germ stat now, by default it's 100%, for those dupes with the medical buff it's 50%. I believe that % is the chance they'll get sick off being "exposed" to a disease. I don't have a way to test that for sure, but I know I've had a few last through being exposed, and they were only ones that I purposely lowered that % as low as I could. The other few dozen tries, they got sick from being exposed, atleast eventually. Exposed seems to wear off after a cycle or two, but again, at 100% I think they're guaranteed to get sick before that. Now, the apothecary. You can create intermediate boosters, which provide -30%. This gives base dupes a 70% chance of getting sick, and those with the buff a 20% chance (Actually reasonable). You can also create cures. Both cures and boosters require a tier 1 doc, and a lot of their time. Plus, boosters take pincha peppernuts, and cures take balm lilys. While these aren't too hard to farm, it's a waste of pinchas you could use on food (for boosters, which last like a cycle or something before you re-administer them), and then you need to actively farm lilys for cures. The cures themselves get used on the "sick bay" building, which work similarly to med-beds before the update. The dupe goes there, sits and waits, and your doc (requires tier 2 doc) will go and administer the cure. They're instantly cured. There's a couple major flaws in this system, one or two already noted earlier (and one or two noted without the actual cause being understood). Listed in what I consider the highest severity first. 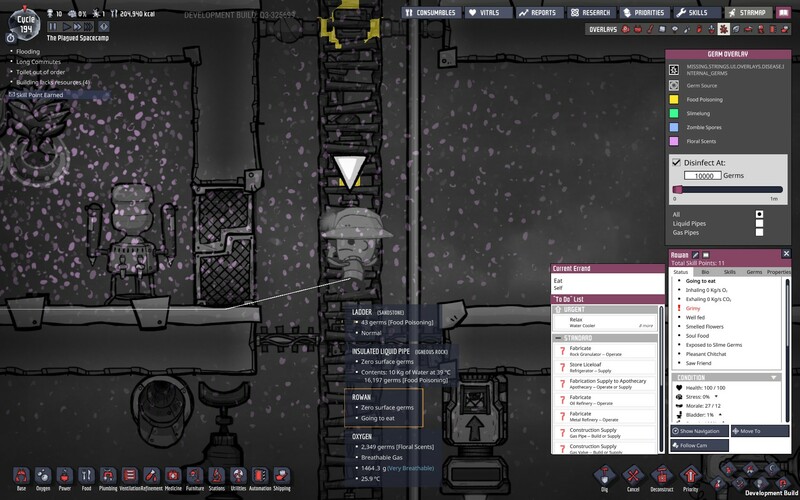 Duplicants can get sick in sterile environments. This is because they become exposed (and become what I call a time bomb) - and then half a cycle later they become sick. This is the biggest issue because, as seen in this thread, it isn't self explanatory. It's going to be a major crutch to new players to even understand what's happening. You can actively avoid slimelung all game, but getting even one tile with slimelung can make it impossible to avoid forevermore. If you get one tile of slimelung and a dupe accidentally breathes it in, they're exposed. Now, base dupe % is 100%, so you're basically guaranteed they'll get sick. Even if you have a sick bay and cure ahead of time, there's a decent chance they sneeze, since they don't contract the disease immediately. That sneeze generates 1,000 slimelung germs, and instantly exposes anyone in the radius. Like, say, anyone that they sleep, go to the bathroom, or eat near. Let alone other chores. 2 & 3 were kind of related, and 4 falls in line. Med bays have been broken. They've been pulled out back and shot in the head. There was one reason to ever make a med bay - they forced quarantine, otherwise you may as well just have a room with medical equipment. Now, to explain why it's broken, let me explain how sick bay (the building) works. You build it, you supply it with a pill, and your sick duplicant will go to it. Then your doctor goes to it, cures them, and all is well with the world. The problem is your bottleneck is pills. How fast can you make the pill? How many do you have stockpiled? Because you know what happens if you don't have any? The sick dupes ignore the sick bay. Also, you can't send the sick dupes to a med-bed, as those only exist for health now. My dupes getting slimelung while standing on sterile tile and breathing sterile air (pic). At least it looks like sterile. But even in that sterile situation they "exposed to slimelung". And I have no clue how. They dont work with infected materials without exosuit. I have sterilized all my slime storages. However the epidemy of slimelung inherit my base developement drastically until I train a doctor. BTW! At first, doctor require train both Tinkering and Kindness skills since first is needed to produce cure faster and second to apply it. At second, slimelung is intermediate sickness and required corresponding skill level (2) and med bed (sick bay). At third, I have no idea how to train "care" since it takes 2 seconds to cure slimelung, further more, I see no point to do it, because of the same reason. Seems strange, but currently my medic need not care skill but require operating one. May be substitution of "care" and "kindness" by "medical skill" will bring more logic in the game? In the contex of apothecary usage too. Your dupes have been exposed prior to contracting. This is when the "Time bomb" (as I call it) kicked in. This is probably half a cycle after when they were exposed. I've seen contrary to point 3 - but there's no way to disprove point 2. I'll just state that I agree, as it wouldn't make sense. But my map has been entirely deodorized, and my dupes are getting sick. That said, I believe the message is broken as it always says Polluted Oxygen. But they're getting sick in a map of O2/Chlorine/CO2/Hydrogen. As an anecdote, I had slime submerged in water while digging. I goofed and it was free for about 3 seconds. It off-gassed once. 20 cycles later I had 5 infected dupes and haven't been able to stop it, and now half my map has slimelung in it. I exhausted ~22 cures and ~40 boosters to no avail. Lower the base chance of contraction. I.E., instead of 100% lower it to about 40%, with the medical buff lowering it to 20 or 25%. Boosters obviously would need tweaked in this as well. Have the number of germs actively affect the chances of getting sick. I'd make it a formula, honestly. I'd say that I should expect a dupe that's consumed roughly 5,000-10,000 of a germ to get sick. With the previous point implemented, that would mean I'd expect it to be about 40% per ~2,000-4,000 germs. Change sick bay (the building) to allow duplicants to be assigned to it. 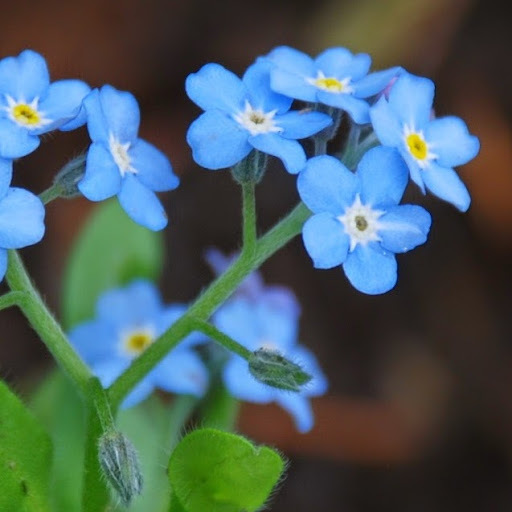 When assigned, they stay in quarantine except for things required to keep them alive. For example, food. They'll sleep in the sick bay. Very similar to how med beds worked before. Fix the time-bombs. I don't care what you do, but I really don't want a dupe to be a timebomb that in 0-1 cycles they'll suddenly be sick. I don't care if you give me a definitive timer, I don't care if you give me a non-definitive timer (we check every 60s), I don't care. I just really hate being blindsided. Update the vital screen. 1.) It needs to show exposures, not just sicknesses. 2.) It should display the germ % that affects how likely they are to get sick. I really just would like to know "Banhi has been exposed to slimelung, and their chance of contracting it is 20%". I'd like to see doctor masks. Make them a textile I can create, and make a building (i'd say 1 wide 2 high) that dispenses them. Single use. Put on when you walk past, expires in 100s. Prevents potential contamination during the time it's on. I'd like to have a doc able to walk into the quarantine zone and not get sick, if I'm willing to throw resources at it. I don't want to risk a bad sneeze while I'm in there and boom, sick. I'd like to see the old med-bed interaction come back. A doc comes over and treats them and they get cured a little faster. Say, 2.5 instead of 4 cycles for slimelung (assuming constant application) - which will probably balance out to more like 3 cycles instead of 4. However, you waste dupe effort to do the caring. These ones are more the "I think this'd be cool so I'm mentioning it" category, though I don't figure these things are really in a flux state that they'd be changed. This is more of a hope than a suggested change (as in, I believe the above is a good solution, I personally just like the idea at this bullet). Make boosters not taken unless a duplicant has been exposed to something. Once exposed, they should rush to take the booster. [Alternatively] Make the boosters tied to the disease. I.E. a slimelung booster. Much like in real life, you don't get a generic booster if you step on a nail. You get a tetanus shot. I'd like to see something similar. This means rarely contracted diseases can have hard materials as their booster, while not overly punishing the super common ones. I'd love for sneezes to not auto-infect. I'd love to see showers reduce the side-effects of disease. I know I typically take a shower when sick, and it makes my symptoms subside a bit. Rename boosters to medicine - and have them reduce the affects of actually being sick. By say, 25%, 50%, 75% (I think there's 3 tiers, right?). The medicine gets used if a duplicant is sick. They can take the same ingredients, or potentially even a bit harsher ingredients. create new boosters for lowering %, and make them have slightly easier to get resources. Or heck, even the same resouces in smaller doses. I'm all for preventative medicine, but if I have 8 dupes, I have probably half a cycle in someone making meds (and that's assuming they have some machine skill), plus the pinchas required to make it. That's alot of pinchas and isn't really a reasonable idea. Last thing: I'm all for making the game hard. I love the game hard. But I also like it to be, in a sense, fair. If I do things right, I take my time, I plan, I should be able to beat it. At this point I'm resolving to get to the surface as fast as possible and research atmo suits (while avoiding mining any slime or opening morb pockets), build the docks for the suits, and just wear the suits EVERYWHERE and water locking my base. It'll work - but it shouldn't be necessary, and any new players won't be doing that. The old system needed a revamp, I'll agree to that. But if the problem is that it wasn't intuitive for new players, I'd argue this one is so much worse. Nevermind being un-intuitive and hard to understand, it's also extremely unforgiving. I saw countless reddit posts after slimelung got introduced where people's whole colonies were collapsing to it and they couldn't figure out how it works. I dread what will happen if this is the norm at launch, because I've put ~700 hours into this game over the last few years and I've never had any problems figuring stuff out after some tinkering around. Despite that, my only solution to this is to avoid the system altogether. The old system needed a revamp, I'll agree to that. But if the problem is that it wasn't intuitive for new players, I'd argue this one is so much worse. What? Why you don't like an evil casino where booster pills are the coins? If you don't have the minimal bet you already lost. In case of having them, you can keep gambling until you're broken... or until you just lose the bet due to RNG despite all the effort and resources already spent. I'm 100% on-board with Juicearific's post. The old system was too easy, most definitely. I could go the whole game with no one getting ill if I was careful. This new system however is unrelentless and frustrating. 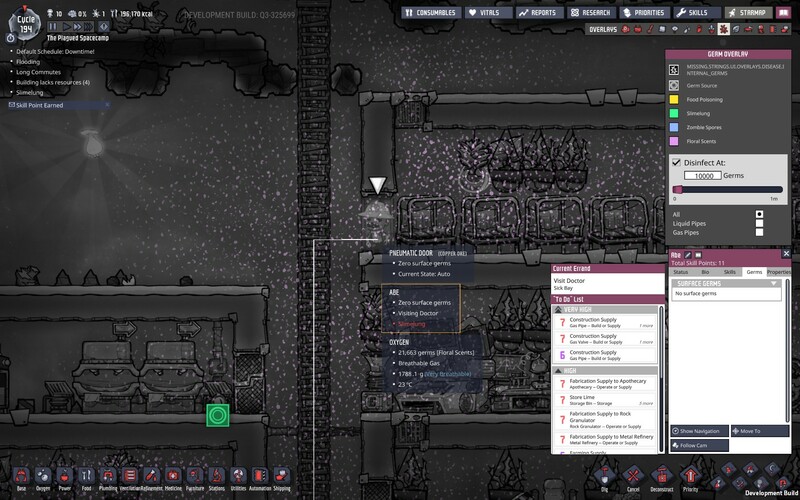 Even with deodorizers all over my base the coughing and sneezing dupes make it impossible to keep the base disinfected. There are always a small handful of PO2 pockets drifting around just out of reach of the deodorizers. One half second jaunt through that diluted oxygen is enough to get sick. And heaven help any poor dupe that gets coughed on. Since my first dupe became infected it's just been a endless loop of folks running through the disease gauntlet. Finally cured by waiting the disease out? Great! You're already exposed again. Get ready to start coughing again in one cycle! Pretty much 50% to 66% of my dupes are sick at any given time. Algae Distillers are just a germ nuke. @Juicearific Excellent post, I really hope the devs read this and make some adjustments. There are always a small handful of PO2 pockets drifting around just out of reach of the deodorizers. Best part about this is the standard gas overlay shows no distinction between O2 and PO2, so you have to just discern from the gas coloring without the overlay. I don't understand why the standard overlay doesn't show the different gasses. I've used the ImprovedGasOverlay mod since discovering it, and I really don't see why this isn't used in the base game. Really? Did you set it to just detect gas only, because it shows the distinction on mine. 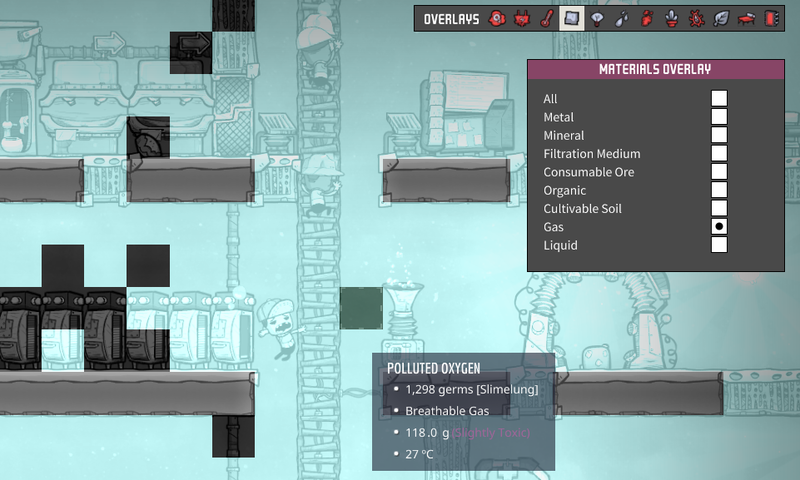 In fact, part of my frustration was that without that overlay I couldn't even tell I had any PO2 because the bubbles were only one tile and blended in with the normal oxygen too well. Here's a screenshot of the overlay in my base. Perhaps if it's not showing right for you there's a bug? so you have to use mid game cures for early game disease???? farming balm lilly, tier 2 doctor, med bays are not something you have before massive slimlung exposure. You're welcome! I used to have that same frustration. I wanted so badly for a way to see individual gases without having to do any guess work since small quantities of any given gas make it very hard to see when it's in a mass of another higher concentrated gas. Was pretty excited to see the new material filters overlay. I don't get what was wrong with the original system. It was a learning curve and then you figured it out and learned to deal with it. But it made sense. Who thought this new system was a good idea? I disagree with this. While I do agree that duplicants CAN get sick in sterile environments, exposure doesn't guarantee sickness. I've had several normal dupes have infrequent exposure to slimelung without getting sick. I had an area in my main biome that had a few tiles of slime. I would have my dupes dig out one or two tiles and carry the slime to a safe location. During this, depending on the timing of off-gassing, the dupes could get exposed. All dupes were completely normal and with normal immunity game play it took several exposures before one got sick. That said.. once a dupe got sick, they would frequently infect others due to repeatedly exposing the other dupes. Note: I realize I quoted the wrong paragraph. I meant to get the one where you said "a single exposure on a normal dupe guarantees sickness." So it seems they decided to keep the new disease system without any changes I could see in the newest hotfix I'm going to play with it for a bit longer but I expect I'll just have to disable the disease system as getting anything done in early midgame is slow enough already without my dupes walking around with a permanent debuff. Interesting. The 3 playthroughs I tried to learn it, they got exposed to the germ from one slime (that accidentally off-gassed once or twice), and got sick from that exposure. And of course, everything went downhill from there. I'd still argue it's too harsh, though if a base dupe can survive that, it makes me wonder how exactly that % works. As for the buddy buds, that's absolutely a great strategy. My issue is that I build compact bases, and dupes sneeze on each other alot. My base is safe if a dupe sneezes while they're alone - I have enough buddy buds inside and directly outside my base to prevent it from spreading at all. However, they sneeze on their friends, who immediately become exposed... and the vicious cycle continues. I do not think the developers play their game. There is an infinite circle here. Dup gets sick, sneezes, the tiny amount of germs takes several cycles to die off, so the cured dup gets reinfected by his own germs. Even putting dup in isolation room does not solve this. Add in more dups, and they can never recover because there is always tiny trace disease from sneezes always in the base air.